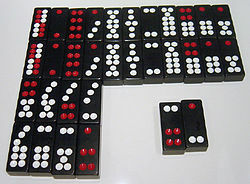 Tien Gow or Tin Kau (Chinese: 天九; Cantonese: tin1 gau2 "Heaven and Nine") is the name of a Chinese trick-taking gambling game for 4 players played with a set of Chinese dominoes. In the game, Heaven is the top rank tile of the civilian suit, while Nine is the top rank tile of the military suit of the domino set. The game of Tien Gow is quite different from Pai Gow. The only similarities are the tiles set and the names of the tiles. It is analogous to comparing the games of poker and bridge. Pai gow is more like poker where the players compare which hand has a higher rank. Tien gow is more like playing bridge with no trump suit and no partner, except that the number of tricks taken does not determine the winner. The player who takes the last trick is the winner of tien gow. There are complex rules to the game play and scoring. There is an accumulating multiplier to the winning and loss as the game proceeds. Since the last trick determines who collects the winning, the players need to rely on luck and strategies to save the strong hand to the last trick. It is a very challenging game to learn and master. Only a small number of Chinese people still know how to play this game. Also ya p'ai now the instruments of the game. A common legend states that in the second year of the Hsüan-ho [宣和二年], in the Sung dynasty [i.q. 1120 AD], a certain official memorialized the throne, praying that the ya p'ai (ivory cards [牙牌]) be fixed as a pack of 32, comprising 127 pips [sic, it should be 227, but Chinese printers are careless], in order to accord with the expanse of the stars and constellations. The combination 'heaven' [6/6, 6/6] consisted of two pieces, containing 24 pips, figures of the 24 solar periods; 'earth' [1/1, 1/1] also composed two pieces, but contained 4 pips, the 4 points of the compass - east, west, south, and north; 'man' [4/4, 4/4] two pieces, containing 16 pips, the virtues of humanity, benevolence, propriety, and wisdom, four-fold; 'harmony' [2/3, 1/3] two pieces of 8 pips, figuring the breath of harmony, which pervades the eight divisions of the year. The other combinations had each their names. There were four players having eight cards apiece for their hand, and the cards won or lost according as the number of the pips was less or in more the winner being rewarded with counters. In-the time of Kao-tsung [高宗 1127-1163] pattern packs were issued by imperial edict. They were known throughout the empire as Ku p'ai, 'bone p'ai;' [骨牌] but it does not follow that this class of games, po-sai [博塞], Ko-wu [格五], and the rest originated in the reign of Hsüan-ho.